The horrific attack on the Jerusalem synagogue earlier this week has raised fears of a new escalation in the Israel and Palestinian conflict. Religious leaders in the UK have at least remained calm and a joint letter from the Archbishop of Canterbury, the Chief Rabbi and Shaykh Ibrahim Mogra demonstrates how communities in the UK can stay united despite the troubling conflict. An interesting article in Haaretz about the once every 33-year coinciding of Yom Kippur and Id al-Adha. For Jews, it will be a day of abstention and repentance. For Muslims, it will be a day of prayer and festivities, topped off with food and revelry. It is organised by the United Nations and a whole load of events are going on worldwide to celebrate peace. Obviously there are arguments about what such a day can achieve, and whether the UN itself makes any difference. But the event does bring people from different communities together, which has to be a good thing. One of the key concerns about the Disaster Emergency Appeal’s Gaza campaign is that some of the money goes to Islamic Relief. This concern stems from concern by Israel that the charity gives money to the Hamas terror group. Islamic Relief has now said it will stop taking DEC money while these allegations are investigated. So does this remove any problems with giving money to the Gaza humanitarian cause? In an unprecedented joint statement, the Jewish Board of Deputies and Muslim Council of Britain (MCB) have condemned Islamophobia and anti-Semitism. In it they acknowledge the “deeply-held views” about the conflict between Israel and Palestinians. The statement describes the loss of civilian life as unacceptable for both religions. The statement says: “In spite of the situation in the Middle East, we must continue to work hard for good community relations in the UK. ChickPeace supported a joint Muslim and Jewish theatre Peace Lab this weekend. The interfaith theatre group MUJU put on a performance and workshop around the theme of peace. The idea was that Jews and Muslims came together to discuss their differences and find common ground, particularly on the Israel-Gaza conflict. 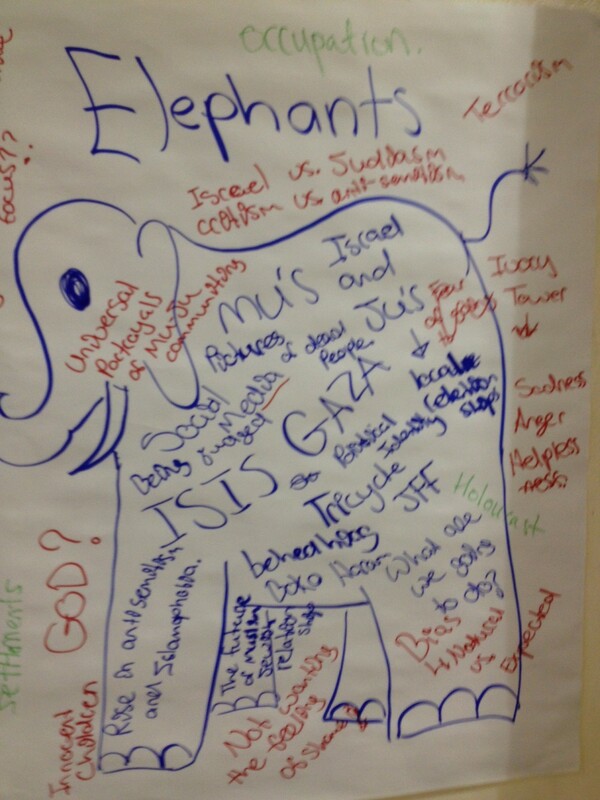 The Middle East is the obvious elephant in the room between the two communities, but the attached image, compiled at the event, shows concerns both sides have. Obviously there are other nuances in the Middle East conflict, but events like the Peace Lab are important, especially amid rising anti-Semitism and Islamophobia, as it shows Muslims and Jews can live beside eachother and work together. ChickPeace is supporting a Jewish-Muslim theatre group called Muju. If you are looking for something to do over the Bank Holiday Weekend, the group is holding a ‘peace lab’ where it will use theatre to bring together the two communities. 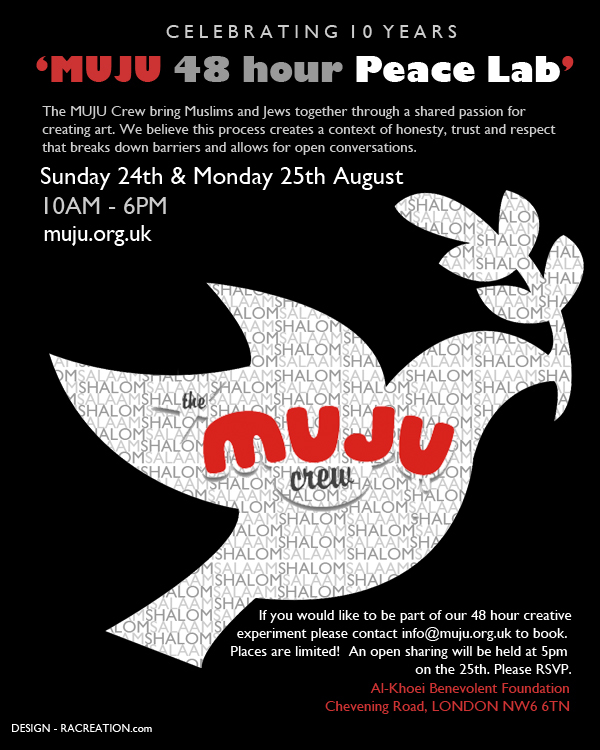 In this time of heightened tension MUJU aims to provide an arena for creative dialogue by hosting a two-day theatre lab in which Muslim and Jewish performers (both professionals and those with a passion for theatre/ arts) come together to explore/ question the theme of Peace, in all it’s possible meanings, through theatre. The outcome will be a piece of theatre that will be shared on the Monday evening. In addition the entire weekend will be facilitated and filmed to be made into a short documentary. This will be screened at various events in the lead up to the International Day of Peace on September 21st. Should a Jewish newspaper run an advert for a humanitarian aid charity raising money for Gaza? The Jewish Chronicle features an advert for the Disasters Emergency Committee’s Gaza humanitarian appeal this week. The aim of the appeal is to raise funds to help people in Gaza who have been affected by the conflict. There are questions about whether humanitarian aid actually gets to the people, or if the Hamas terrorist group uses it for its own means. Many JC readers have got angry that a Jewish newspaper would feature an advert raising money for Gaza. Those opposed believe featuring the advert belittles Israel’s right to defend itself and helps fund Hamas. This is because one of the recipients of DEC aid is Islamic Relief, which is viewed with suspicion by Israel. The editor Stephen Pollard has received letters, emails and tweets of concern, and is being accused of letting the Jewish community down and failing to stand up for Israel. The JC has since apologised and promised to run an ad next week featuring Israel-related charities. Was it really necessary to apologise? Do we as Jews and non-Jews not accept that there is a humanitarian crisis in Gaza, regardless of who is at fault? There is even a Facebook group calling for a boycott of the JC! There is a term in Judaism called chillul hashem. The idea is that you shouldn’t do anything that desecrates the name of G-d.
How does calling for a JC boycott and opposing raising money for humanitarian aid help show Jews as a light unto the nations? There is a fear that aid reaches Hamas, but the DEC represents a number of charities, not just Islamic Relief and we should be pressuring the international community to monitor this, not stopping money being raised for medical and food supplies. Realistically, Hamas cannot make rockets out of nappies, potatoes or medicine, and we need to pressure the international community to make sure these supplies get through to the people. Would you be equally opposed to an aid for aid in Syria or Iraq? Ultimately, the Jewish Chronicle is a newspaper. It is not a communal body or the PR representative of the Jewish community. And even if people think it is, what paints a better picture, a community asking it to raise money for people (not terrorists) in need of humanitarian support, or one asking for it to only raise money for Israeli people in need? We should be promoting dialogue at this tense time, not creating division. You can get various forms of hummus and many brands taste different for what is essentially chickpeas. But now Sabra, one of the biggest hummus makers in the US, is fed up of poor imitations and wants a standardised definition so that fans of the chickpea are not being fooled. It has sent a petition to the US food regulator, the FDA, to create a set definition for hummus, as is done for other items such as cream cheese and peanut butter. Sabra says: “Hummus must be comprised (by weight, besides water) predominately of chickpeas, and must be no less than 5% tahini. Sabra defines hummus as, “the semisolid food prepared from mixing cooked, dehydrated, or dried chickpeas and tahini with one or more optional ingredients,” some of which are specified in the 11-page petition. Are ‘Jewish jihadis’ doing Israel a disservice? Journalist Anshel Pfeffer has written a Haaretz column warning that those who say Israel is always right and the world is out to get us are causing long-term damage to Israel. He questions the usefulness of attacking journalists and the media through social media over its coverage of the conflict. ChickPeace agrees with the view that much of this conflict has been fought out over social media, with supporters on both sides often aggressively sharing their viewpoint of the conflict and coming up with images or data to back it up. The trouble with this approach is that this can often descend into jibes and personal abuse, when really we are working towards the same goal, peace. Do you think social media has weakened or helped Israel’s image?